It’s less than 10 pages and includes detailed steps to get up and running with Thycotic Secret Server, including a checklist so you can track your progress. Download Thycotic Secret Server. Once downloaded, you’ll get one free user license. The installation is a simple, 5-step process after which you can begin to manage your passwords right away. You’ll need this account to do the initial configuration, and to convert your trial into a production environment. This will set up your licenses, email, and create your first group. 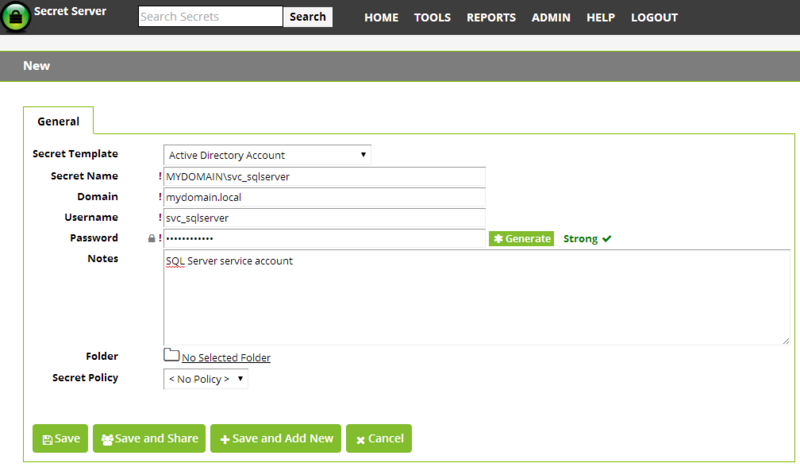 Thycotic Secret Server allows authenticated users to log in using their Active Directory credentials, and synchronizes AD users from domain groups on a configurable interval. Thycotic Secret Server will not store the domain user’s passwords, but will pass the credentials through to the domain to authenticate. From Dashboard (HOME), go to the upper-right corner and select a Secret template from the drop-down menu. You’ll automatically be directed to a page containing all the relevant fields to create your first Secret. Review the Getting Started PDF for a full implementation checklist.